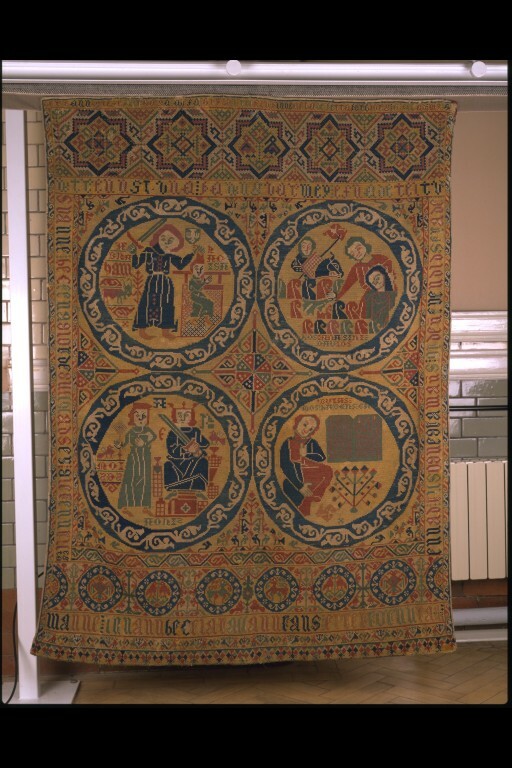 The subject is religious; reading anti-clockwise from the top left the images represent: The Sacrifice of Isaac, Moses before Pharoah, Moses with the Tablets of the Law and Christ entering Jerusalem. 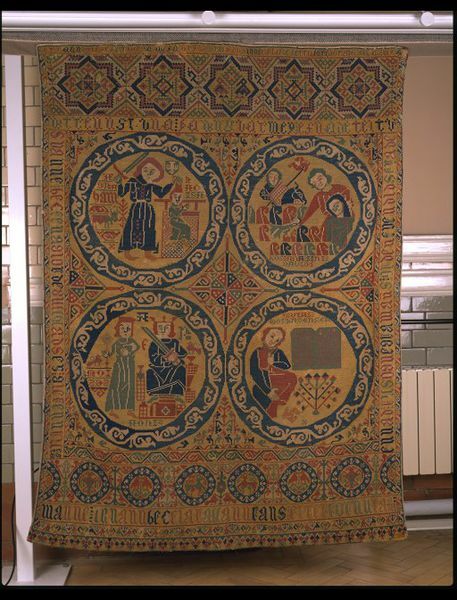 The inscriptions consist of three verses composed by the magistrate Páll Vídalín, husband of the noted Icelandic embroideress, Thorbjorg Magnusdottir (1667-1737) who made this bedcover. They were married in 1696 and according to the last two lines of the third verse the wife embroidered 'the words' according to her 'husband's instructions' indicating that at least part of the cover was worked after their marriage. 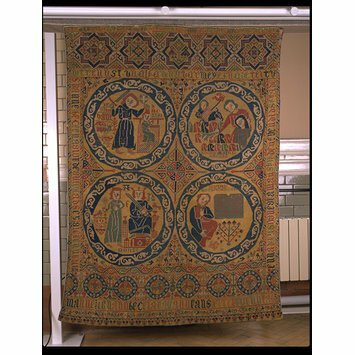 Bed Cover, wool embroidered with wool in long-armed cross stitch with eyelets. The inscriptions consist of three verses composed by the magistrate Páll Vídalín, husband of the noted Icelandic embroideress, Thorbjorg Magnusdottir [1667-1737] who made this bedcover. They were married in 1696 and according to the last two lines of the third verse the wife embroidered 'the words' according to her 'husband's instructions' indicating that at least part of the cover was worked after their marriage. Embroidered bed cover by Thorbjorg Magusdottir, made in Iceland, 17th century.